Last weekend, we asked bloggers to 'Define Faith'. And it was humbling to read such posts. Well done. Thank you for sharing your views. Some new learnings for us in there. Don't forget to participate in WOW regularly. It is such a joy to read your posts. 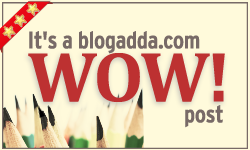 Here is the WOW badge that you can put up on your blog proudly and share it on your social networks! Go ahead, take your badge and share!